It’s been a long wait for fans, but Kingdom Hearts III is finally here. For many that wait will prove worthwhile; the production values are outstanding, while the way the game wraps up many plot threads will be of immense satisfaction to fans. However, some familiar issues also return, and the time spent on what ultimately amounts to gallivanting around Disney properties before rushing a reconciliation of its many obscure plot threads means that those not fully versed in its lore will be left uncertain as to quite why the series is considered such a big deal. Kingdom Hearts III picks up after the events of 3DS title Dream Drop Distance, with Sora having failed his Mark of Mastery exam. This causes Yen Sid to send Sora and his companions Donald and Goofy back out into the universe to try and rediscover the nebulous “power of waking”, thus giving Sora the excuse to spend many hours visiting other worlds. 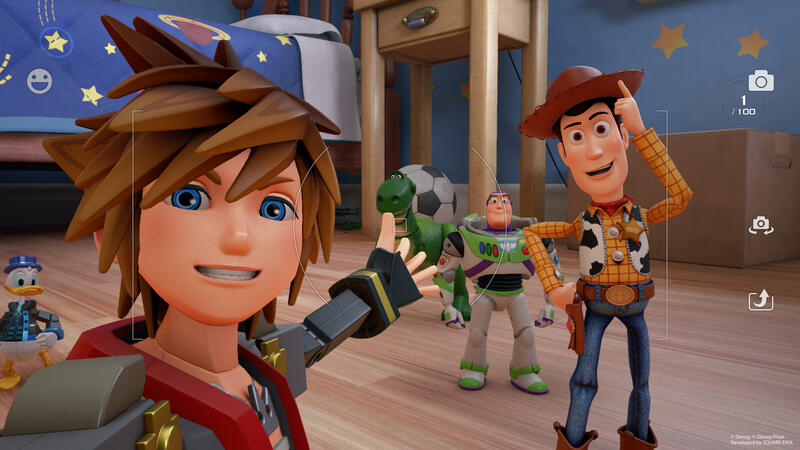 After quick stops at the familiar locations of Olympus and then Twilight Town, Sora and his pals head off to visit other worlds based on several different Disney properties. The pattern of Sora visiting worlds for no other apparent reason than simply because they are there, interspersed with cutscenes related to the wider plot that are haphazardly thrown out, continues for around three-quarters of the game. The problem is that there is clearly no grand plan in integrating these events with what’s happening in Sora’s journey, so they just come across as disconnected asides, and don’t paint Sora in a good light as everyone else appears to be working towards something — even though it’s never entirely apparent what that is — while Sora just wanders around. A large number of familiar antagonists appear, though players will be none the wiser as to what it is exactly each of them is trying to achieve. When Kingdom Hearts III escapes the orbits of the Disney worlds is when the plot finally starts taking off and providing some semblance of logic. The latter portions of the game are easily its most engaging, though the exact goals of the antagonists and quite why things happen in the way they do are still shrouded in mystery and never satisfactorily answered. What Kingdom Hearts III achieves and deserves credit for is providing great finales for a large number of the plot threads left lingering from the series’ many side entries. The game also does a great job at getting across the emotional scenes; once Sora stops messing around and becomes involved in the plot he also ends up as a worthwhile protagonist, while he and the rest of the main cast all help each other out and become a highly endearing team. Many questions, including some new ones, are still to be answered after everything is said and done, but the ending does largely what it promised to do and wraps a nice bow on this particular part of the story. Outside of the main plot, each of the Disney worlds has its own separate tale to tell. Some of these, like those based on Frozen and Tangled, are simple, highly-condensed retellings of their movies plots, while others, such as Toy Story and Monsters Inc., feature wholly original tales set after the respective movies. Those worlds in the latter category are generally the most interesting, but all of the worlds have something going for them. Many of the worlds also have their own interesting gameplay elements, such as the sailing in Pirates of the Caribbean and the ability to fight in mechs in Toy Story, which help to separate them a bit but never deviate too much from the formula. The action combat starts out weakly as the first couple of worlds offer only the basics and a lot of repetitive encounters, but gets more interesting soon enough. Sora is able to access multiple keyblades and there’s decent differentiation across them, particularly with Formchanges that can be activated after charging up by attacking enemies. Each keyblade has two consecutive Formchanges that alter how they attack; for example, the keyblade obtained from Monstropolis changes to first dual claws and then dual yo-yos, each providing enough of a change and enhancement to their attacks to make unleashing them highly satisfactory. Individual keyblades are geared more towards strength or magic, making an appreciable effort to accommodate differing play styles. The different keyblade options make combat a lot more interesting. Kingdom Hearts III is primarily about unleashing quick combos at the right time, and many bosses reflect this as there are fairly obvious flags signalling when to dodge and when to attack. There is a lot of repetition, and during the lengthier worlds running into encounters becomes tiresome, but the number of abilities Sora has at his disposal helps things. 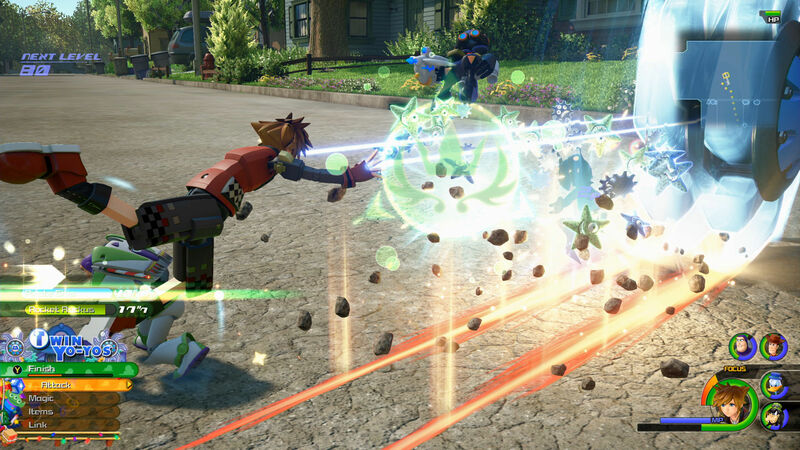 In addition to the keyblades and Final Fantasy magic spells — one of a negligible amount of Final Fantasy elements that remains in the series at this point — Sora has link attacks where he teams up with other Disney characters, as well as special Attraction summons that cause a Disney theme park ride to appear and deal large amounts of damage. Character progression is linear; there are rudimentary equipment and ability options, but these don’t provide much in terms of being able to customise the playing style. Still, combat doesn’t really deviate from its regular back-and-forth nature. On the standard difficulty, there is never a need to change up tactics, so it becomes more the player’s choice to change things rather than being encouraged by the game itself. The camera has long been an issue in Kingdom Hearts. That’s still the case in III, but its issues at least have been mitigated and players have more control over it. Thankfully, the vast majority of areas are nice and open so there isn’t anything that causes the camera to become an active hindrance rather than just a mild annoyance. However, there is one sequence of battles towards the end in particular that appears to be designed so that the lock-on option, which in general is not overly useful, causes more difficulty than the enemy itself. There is plenty of side entertainment on offer for players who want to do it, such as exploring in the completely revamped Gummi Ships or the multitude of classic Game & Watch-style minigames, but the game doesn’t provide much incentive to try them out. 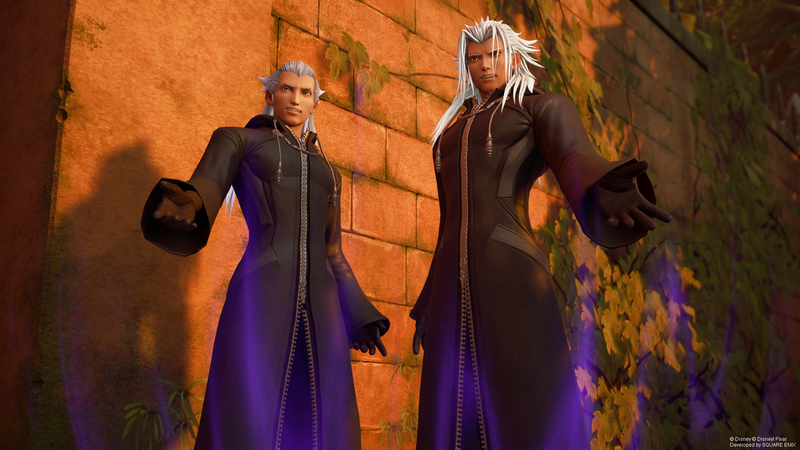 The presentation is without a doubt Kingdom Hearts III’s strongest aspect. All of the Disney worlds and character models look fantastic, though a bit of uncanny valley sneaks into Pirates of the Caribbean as it attempts to emulate the live-action films. Credit has to be given to the direction and design of all the cutscenes as well as on the various set pieces. Even if some events don’t make much sense, they look great. There are plenty of stunning views and great level designs, with plenty of NPCs bringing lots of life to certain towns, and the animations throughout are fantastic — including its emulations of major scenes from the relevant movies. There are plenty of loading screens, but these are never long enough to cause too much of an issue and often include neat touches such as social media-style entries from cast members. Once Sora stops messing around, the overall plot finally starts to come together, even though it takes him three-quarters of the game to do so. The audio is also very strong. Composed by the team of Yoko Shimomura, Takeharu Ishimoto, and Tsuyoshi Sekito, the music offers a good variety of familiar themes and new tracks, in addition to a few lifted straight from Disney. The music is always complementary to the visuals and does a great job helping to sell both the action-packed and emotional scenes in the game. Certain tracks in some of the worlds noticeably repeat, but are still enjoyable and catchy enough for this to not be an issue. Voice acting is generally strong, with Haley Joel Osment doing a fine job as Sora along with most of the rest of the cast. Plenty of the Disney characters are voiced by their actors from the movies, but there are a few where the soundalikes are noticeably different from the originals. Despite that, the performances provided are good enough that this is a brief hesitation rather than any serious distraction. Kingdom Hearts III is most assuredly one for the fans. For those who have enjoyed the past entries, the issues have already proven themselves to be readily surmountable and the way the game wraps up the lingering plot points will be very much appreciated. However, for those who haven’t yet been sold on the series, it’s a much more varied proposition. The disconnect between the final quarter and the rest of the game is jarring, and the gameplay, while certainly enjoyable, doesn’t offer much to distinguish itself from many other action RPGs. I have a love/hate relationship with kingdom hearts. On one hand, I think the series introduced a lot of bad habit to square, mainly the dumbing down of its art and aesthetics. It ushered in a way for games to be more of a product. I also think the series is sort of always stuck in a sort of 2000s sensibility that can feel a bit dated. With that said, I still find the games really fun to play because of the ton of variety the games offer. They are sort of like a theme park, go here and do this have a great time. The less I over think it the more entertaining it can be. Sora moves around so effortlessly I can zip around the world having fun. Unfortunately the worlds are all still fairly limited in scope. Wether for pacing or development reasons, this was something I was hoping would change its part 3, and it only mildly did in comparison. They are bigger with more content, but still maybe not what some may hope. I managed to log a ton of hours into the game in a short period, and it’s one of the handful of games I’ve ever got the platinum trophy for. So I can really love and appreciate what is there, even if the whole isn’t always my taste. Nice to see an accurate and honest review instead of all the company bootlicker reviews. Any review that gives Kingdom Hearts’ story a great mark should be thrown out. Nomura could do great art back in the day but his plots and character development are subpar.